In reality jojoba oil is not an oil but a liquid wax, and is pronounced "ho-ho-ba" and became important in the 1970s when whaling was banned, since it has almost the same properties as the oil obtained from the sperm whale. If a good nourishing ingredient is needed for hair care, jojoba oil is also sometimes added to commercial hair care products, but due to the cost of jojoba oil, the quantities so included are low. 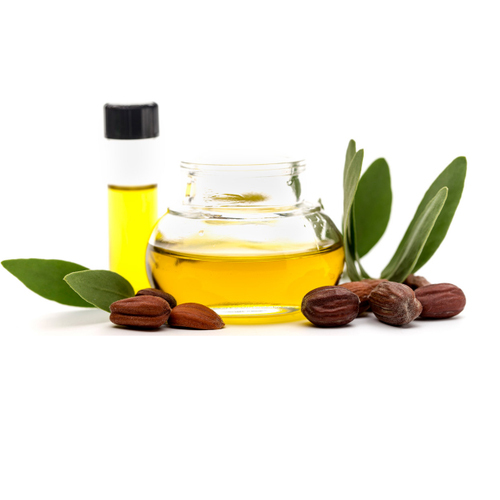 Jojoba oil is obtained by cold pressing of seeds. Jojoba Oil blend well with Palmarosa, Sandalwood, Rose, Patchouli and most of the Essential oils. Jojoba Oil used as a massage medium, it acts as an emulsifier with the skin's natural sebum and gently unclogs the pores and lifts grime and imbedded impurities. Jojoba oil is actually a mixture of long chain monounsaturated liquid wax esters. They are structurally different from triglycerides, which are what most of the other seed oils are made of. Pure jojoba oil has a bright, golden color whereas processed jojoba oil is clear and transparent. It has a high shelf life and can be stored for long periods as it is a relatively stable liquid. It does not oxidize easily and will not turn rancid compared to other oils because it does not contain triglycerides, unlike most other vegetable oils such as grape seed oil and coconut oil. Heavy Metals (as Pb) Less than 10mg/Kg.